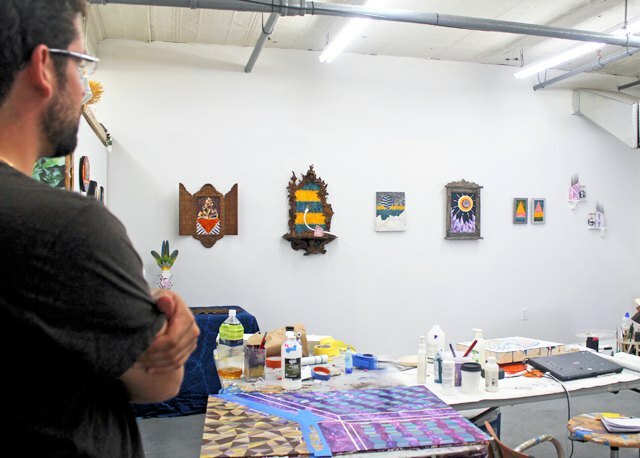 When you walk into Christian Berman’s second-floor studio inside The Active Space you might feel an intrinsic pull toward one side of the room over the other, it depends on your preference—Mexican symbolism or Native American iconography. Speaking through material selections and natural forms, Christian explores the role of the tribal, the communal, and the artisanal inspired by the industrial landscape of Bushwick, integrating natural and found elements. 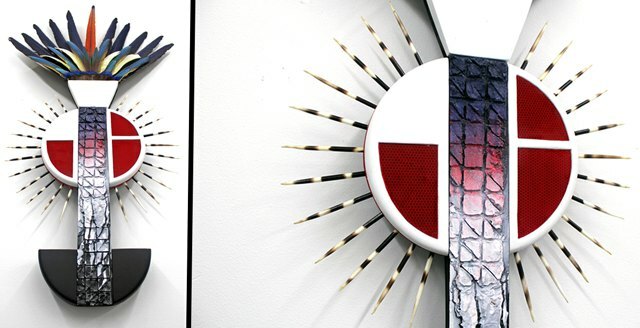 A mix of materials form his sculptures and paintings including macaw, cockatoo and peacock feathers, African porcupine quills, mother of pearl and donkey ear shell; vintage Cadillac headlights, minuscule mink skulls and even antique frames from his grandmother’s house in Mexico. A question Christian often gets: “Are the feathers real?” Not only are they real, there is a sure nature to a majority of his materials. Acrylic, which comes from petroleum originated from decomposed materials including dinosaur bones, was once just as alive as the bodies from which his body of work is made. Christian’s audience often wonders what is real and what is fabricated. In pieces like Brooklyn, Queen of Aztlan (pictured below) and Tikal Speedway Boogie, he tells me that the feathers are naturally molted from bird rescues, retaining their original colors—not painted or spray painted over as many viewers of his work assume. The use of these materials tend to remind some of 16th century Nahuatl feather mosaics, mixing the sacred, the old and the new as Christian’s pieces begin to appear as artifacts inside of his studio. Tradition and history influence a bold selection of materials here. Within Christian’s studio you feel the influence of Mexican folklore accompanied by a collection of indigenous Native American symbolism and iconography. 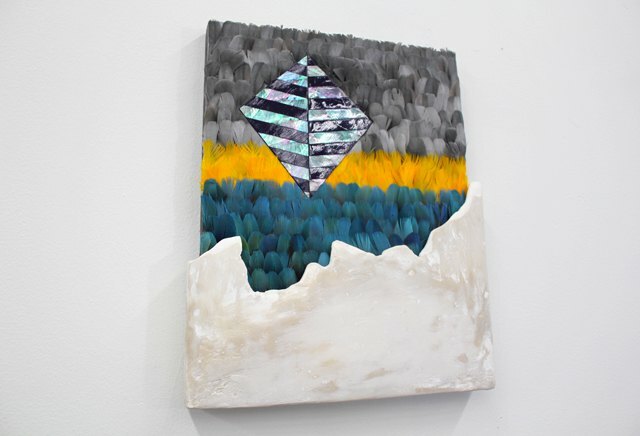 Reminding us of the lost art of using feathers and quills used to create mosaics and collages, Christian utilizes the animal components, allowing intuition to mold and combine them from there. 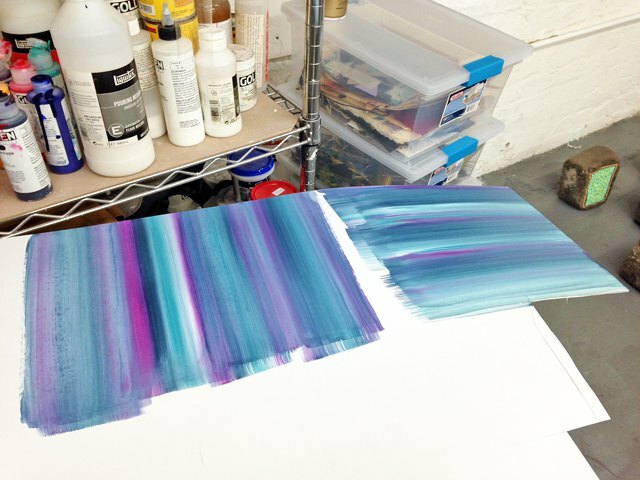 Christian’s studio made a statement at this year’s Bushwick Open Studios when Hyperallergic named him one of 10 Artists to Watch. His Portals series was part of Christopher Stout’s Bushwick Art Crit Group Pop-up show and the BACG Benefit at Brooklyn Fireproof. In his curated show Digital Skin, now open at Katrina Van Tassel Projects in the Lower East Side (through August 7th), Christian explores ideological and material concepts through three artists whose works are drawn from emotional and personal interactions with the digital world. A visit to the space reveals a clever mix of food, detritus and reflective materials.